Pontis, S. 2018. Making Sense of Field Research: A Practical Guide for Information Designers. Routledge, UK. Sheila Pontis’s Advice to Designers: ‘Be Curious’ by Gnanaseharan, M. (2019). U.S.1 Princeton Newspaper, NJ. Princeton’s new TigerWell initiative shines a light on student health and wellbeing by Labrecque, J. (2019). University Advancement, Princeton University. Pontis, S. 2017. Understanding patterns of change and growth in information graphics. In Past, Present, Future: 25 Years of Infographics. What’s Next? Malofiej 1993-2017. Society for News Design [SND-E], 45-47. Greifeneder, E., Pontis, S., Blandford, A., Attalla, H., Neal, D. and Schlebbe, K. 2017. Researchers’ attitudes toward the use of social networking sites. Journal of Documentation (JD), 74(1), 119-136. Pontis, S. and Babwahsingh, M. 2016. Improving information design practice: A closer look at conceptual design methods. Information Design Journal (IDJ), 22(3), 249–265. Pontis, S. and Babwahsingh, M. 2016. Start with the basics: Understanding before doing. In: VisionPlus 2015 Conference: Information+Design=Performance Proceedings (IIID, IDA.Birmingham, England), 90-102. Pontis, S., Greifeneder, E., Attalla, H., Neal, D. and Blandford, A. 2015. Keeping up-to-date: An Academic Researcher’s Information Journey. Journal of the Association for Information Science and Technology (JASIST) – Print version: Volume 68, Issue 1, January 2017, 22–35. Pontis, S., Kefalidou, G., Blandford, A., Forth, J., Makri, S., Sharples, S., Wiggins, G. and Woods, M. 2015. Academics’ responses to encountered information: context matters. Journal of the Association for Information Science and Technology (JASIST), 67(8), 1883-1903. Pontis, S. and Blandford, A. 2015. Understanding “influence”: An empirical test of the Data-Frame theory of Sensemaking. Journal of the Association for Information Science and Technology (JASIST), 67(4), 841–858. Pontis, S. and Blandford, A. 2015. Understanding “influence”: An exploratory study of academics’ process of knowledge construction through iterative and interactive information seeking. Journal of the Association for Information Science and Technology (JASIST), 66(8), 1576-1593. Pontis, S. 2014. A guided approach to conceptual design in the information design process. Information Design Journal (IDJ), 21(2), 115-128. Pontis, S., 2012. Metascience: a paradigm for postgraduate communication design research. Iridescent: Icograda Journal of Design Research, 2(1), pp.30-51. Pontis, S., 2010. De intuición a teoría. Caso de estudio: el mapa diagramático del metro de Londres (From intuition to theory. Case study: the London underground diagrammatic map) Quadra. Revista de diseño y comunicación visual, 5, pp.25-34. Mexico: Universidad de Guadalajara. Pontis, S., 2009. Improving the visual communication of complex information in the health sector. Touchpoint Issue 2, Service Design Journal, 1(2), p.115. Pontis, S., 2009. Diseño gráfico: un novel objeto de investigación. Caso de estudio: el proceso de diseño (Graphic Design: A Novel Research Object. Case study: Design Process). Iconofacto. Revista de la Escuela de Arquitectura y Diseño, 5(6), pp.9-18. Medellín (Colombia): Universidad Pontificia Bolivariana. Pontis, S. and Babwahsingh, M. 2015. Start with the basics: Understanding before doing. In: Visual Plus 2015 Conference: Information+Design=Performance – IIID, IDA. Birmingham, England, 3-4 September 2015. Pontis, S. 2012. Behind-The-Scenes of Information Design [Abstract] 18-23 March. In: ‘Show, Don’t Tell.’ Malofiej International Conference – 20th Edition. University of Navarra, Spain. Pontis, S., 2011. The role of design: yesterday and today. In: A Esperanca Projectual. Book of Proceedings DESIGNA 2011, 1stInternational Conference on Design in the University of Beira Interior. Covilhã, Portugal 25-26 November 2011. pp.63-71. Pontis, S., 2010. Methodological approaches for diagramming information. In: Higher Institute for Education and Science and Polytechnic Institute of Tomar, 1st International Conference on Design and Graphic Printing (CIDAG). Lisbon, Portugal 27-29 October 2010. pp.1-10. Pontis, S., 2009. 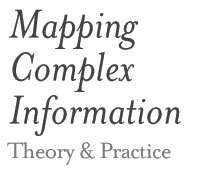 Design method for mapping complex information (MapCI) [Abstract] In: Visual Methods Conference Book of proceedings, University of Leeds 1st International Visual Methods Conference. Leeds, UK. 15-17 September 2009. Pontis, S. and Del Hoyo Arjona, J., 2008. La esquematica, ciencia de la visualizacion del dato como la interficie proxima del conocimiento (The schematic, the science of data visualisation, as a future connection of knowledge). In: 3er Simposio Iberoamericano en comunicacion del conocimiento y conferencias (CCC), 7ma Conferencia Iberoamericana en Sistemas, Cibernetica e Informotica (CISCI), 2008. Orlando, Florida, US., 29 June – 2 July 2008, pp.1-5. Pontis, S. and Del Hoyo Arjona, J., 2008. Graphic matrix for specific data visualisation projects. Proposal of graphic resources and visual elements that for their function could be considered as the primary elements of a matrix. In: Books of proceedings. IADIS International conference on computer graphics and visualization (CGV). Amsterdam, Holland 24-26 July 2008. pp.221-26.